How long does it take to finish an International Distance Triathlon? 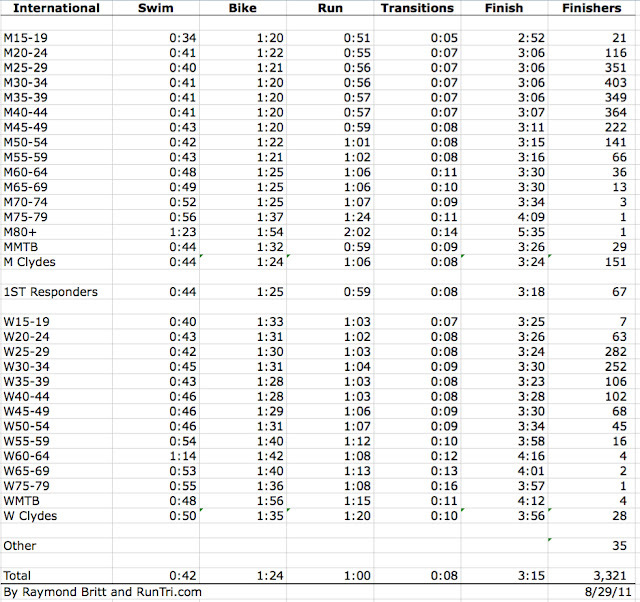 The answer, based on our analysis of more than 75 triathlons: about 3 hours, on average. Swim 1.5k in 40 minutes, Bike 40k in an hour and 20 minutes, and Run 10k in one hour. Transitions included in the total. 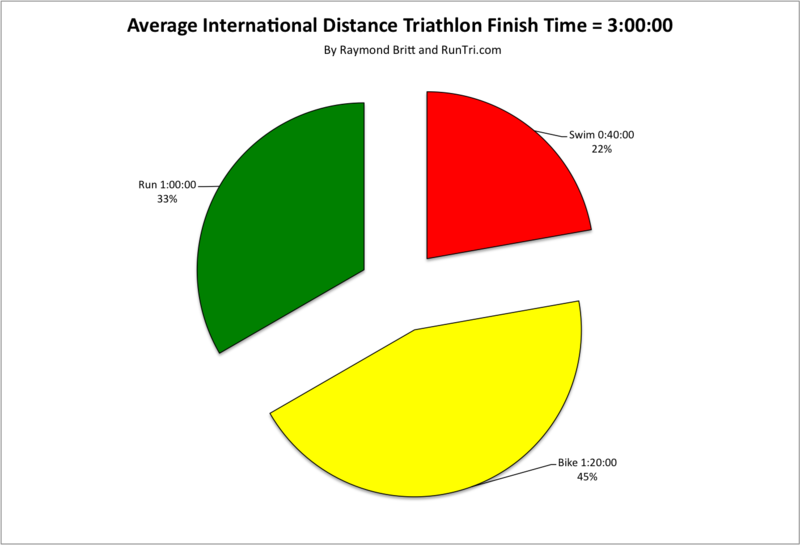 It's important to note that there can be, and often are, variations between one international distance triathlon and another, which will affect average finish times. Are all swim courses measured accurately? No. Are some bike courses longer than 40k? Yes; the Chicago Triathlon is a good example. The most reliable number is the run. Most 10k courses are measured relatively accurately, and on average, most runners do finish in 55 minutes to 1 hour. Of course, there will be variations by age group and male vs female. So the next step is to compare average finish times by age group. 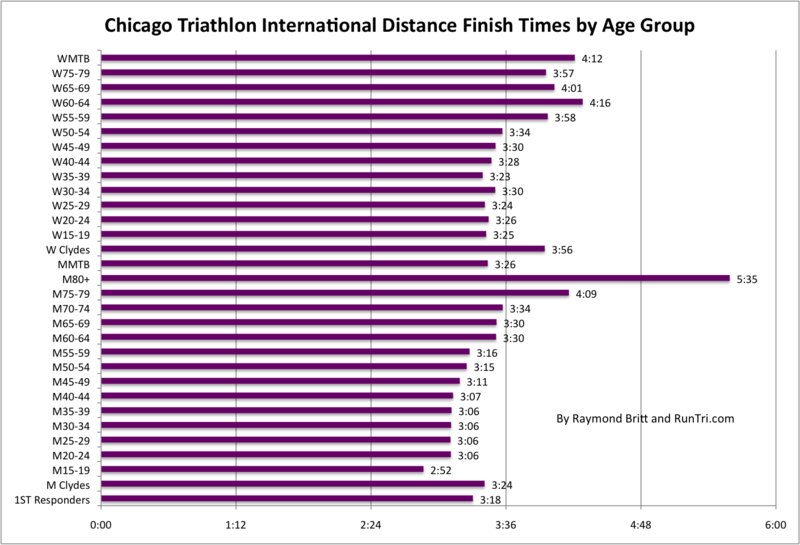 This chart is for the 2011 Chicago Triathlon, average finish time 3:15. The swim was choppy, the bike course was, as always, long, but like most, the run course was average. Consider these times the high end of the International Distance Finish Times spectrum. If you're looking for a target finish time, you want to do better than these. We've mentioned variations primarily between swim and bike courses, so it's important to go the next level -- to look at swim, bike, run and transition split times by age group. 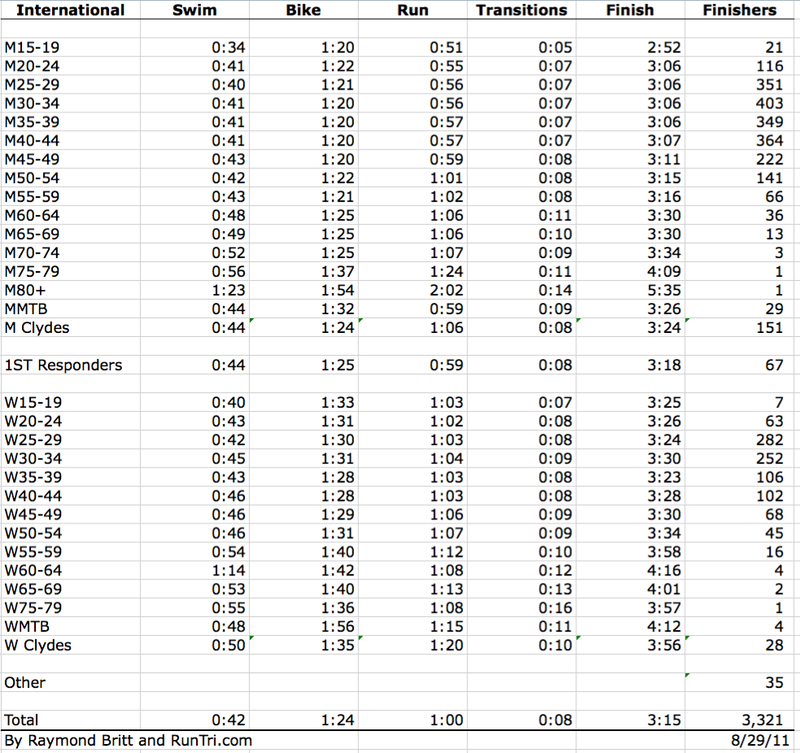 Again this data is for the 2011 Chicago International Distance Triathlon. And, as noted above, consider these splits -- transitions, too -- as roughly the high range; you want to beat these times.